Broadman bulletins feature beautiful 4-color images and copy designed for different uses. 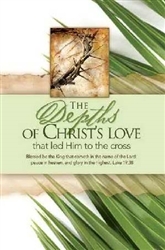 This 8 1/2" x 11", bi-fold bulletin is designed for use as a Palm Sunday bulletin. The bulletin is unfolded and comes shrink-wrapped in packages of 100. Inside pages and back of each bulletin are blank so your church can personalize them.